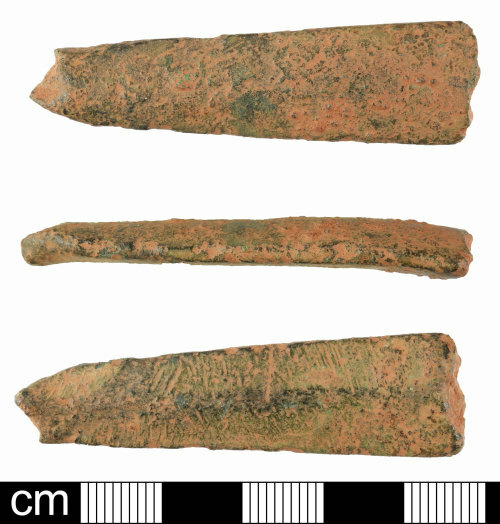 A fragment from a Post-Medieval copper alloy spur, probably dating to c. 1600-1850. The surviving fragment consists of a section of one arm, this is subrectangular in plan, tapering slaightly towards one end and with a squat, lozengiform cross section. It is undecorated, terminating in old breaks at either end. Dimensions: length 55.1mm; width 15.2mm; thickness 5.5mm; weight 20.36g. Ellis (1988) notes that spurs became increasingly fashionable in the 17th century, and whilst this example is too fragmentary to be paralleled it is likely that it dates to this period.